You really can get back pain relief by doing the lower back pain exercises from the Body Window! In this article, I offer just that! Most likely you arrived here because either you or someone you love is affected by lower back pain. Whether this pain is from sacrolilac dysfunction, sciatica, muscle spasms from a back strain, or some other cause, the same lower back pain exercises are used. The statistics from the National Institute of Health, in the USA, are alarming. According to the NIH, a full eight out of ten people here suffer from lower back pain during their lifetime! If you are one of the two out of ten, you are very lucky! So many people hold their tension in the lower back. Because the vertebrae in the lower back are hyper-mobile and the muscles can be easily over-stretched, it is easy to strain this area. Add the emotional component of stress to the held tension and lower back pain is often the result. In order to heal your lower back pain, you need to understand this emotional component, and take the time to listen to and nurture yourself. I have made listening to your Body Window easy for you, by creating a lower back pain treatment plan that will help you release your pain. I have created lower back pain exercise videos that can be used in your holistic lower back pain treatment. Consult with your primary care provider to ensure it is safe to do a yoga/meditation practice and also look at other forms of complementary care. You can consult me for holistic health coaching as well, and I will be happy to guide you if you so desire! Are YOU unable to hear your body's message? Unfortunately, most people are not yet ready to "hear" the message of their lower back pain and are not willing to do the necessary inner work. They just try to bull-dog their way through it by popping pain pills and just "buck up" and deal with it. The pain becomes a mind game, when the mind is the problem in the first place! Chronic pain, especially chronic lower back pain, is a result of tensions in your body-mind-soul that reflects how you respond to your life's experiences! Chronic contraction of the muscles, never allowing them to relax, is a set-up for constant pain. In order to listen to your Body Window that is speaking to you through your lower back, you must let go of your brain and open your heart to be present to your pain. Starting with gentle movements on a foam roller, and slow, deeply releasing yoga stretches help you become aware of just how much tension you hold in your lower back! As you expand your consciousness of your body, you allow the time and space to reflect on the metaphysical reasons you have this pain. This process is a slow revelation, as you learn to release and let go of all that is causing your pain. This process requires lots and lots of time, and a committment to healing! Most people want instant fixes and pills to take it all away. If this is your approach to your pain, I guarantee that you will be battling your pain for the rest of your life! My lower back pain exercises are geared so you will utilize YOUR OWN intuition! In my videos, that come in a bundle, I offer both an instructional video and a meditative video. Instead of having just one video filled with talking and hearing MY voice, I offer a complimentary meditative video, so you can hear YOUR inner voice! You first learn the moves by watching the instructional video. Then when you know how to do them safely and meditatively, you put on the meditative one. It's just that simple. You then can do the lower back pain exercises, mindfully and meditatively to help you find your own inner truth. This re-connects your body and your soul for healing. My lower back pain exercise video is unique in this fashion. Just relax, listen to the healing music, and melt into to your body for it's wisdom, so you can heal! Ultimately, it is you that are accountable for your own healing! It is you and you alone that need to make the change. Not your doctor, not your massage therapist, not your spouse. They can all help you temporarily, but if you do not change your held patterns of belief, you will not permanently heal your lower back pain. Your lower back is telling you that something in your life needs fixing. Something that you must change. Your lower back is your wake-up call! If you see your body as a blessing, instead of a curse, you will listen to it, and realize that your way of being is no longer what is best for you! This is the first step toward healing. In order to do my meditative, lower back pain exercises in my videos, your will need a foam roller. I have found, that this inexpensive piece of equipment is the single most transformational piece of equipment on the market. If you don't already have one, please consider purchasing one today! The foam roller should be in your personal arsenal for your lower back pain treatment plan. You will not regret getting one. Just click here to see a great selection of foam rollers. Get the most expensive model, if you can afford it. They tend to be much more comfortable and last longer. They have cushioning and a textured surface to aid you. Your lower back needs this! Comfort is very important if you are in pain. The premium foam rollers are hard to find in the local sporting goods stores. Get the 36 inch full round size. That is what you need to perform my lower back pain exercises that I show in the videos. The larger size is also much easier to use and more useful for many more foam roller exercises. By purchasing this lower back pain video program, that includes TWO videos you are agreeing that you have received clearance from your primary health care provider to begin this practice. The Body Window, LLC is not responsible for your choices if you chose to ignore your body and push through more than mild pain. These lower back pain videos are designed to bring you lower back pain relief, not additional injury. You must participate appropriately, by listening to your own body’s messages of pain. Proceed with care when you begin these lower back pain exercises. If any particular movement brings you more than mild pain, please discontinue that movement. You may try the next movement. Or perhaps, you need to give your lower back a longer rest period or seek your primary care provider's advice. The lower back stretches and foam roller exercises in the BW Lower Back Pain Videos are gentle and designed to be healing. Please always do the foam roller exercises before you do the yoga stretches. This will increase the blood flow to your back and hips and get them ready for the gentle, slow stretches. A knotted up rope will not stretch very far. The foam rolling will help you massage out the knots first to make your lower back stretches more effective. 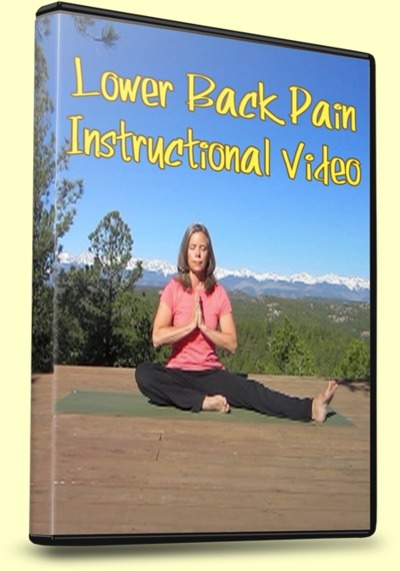 The Body Window Lower Back Pain Videos are full-length videos of approximately 38 minutes each. Please watch the Instructional Video first and practice the healing movements in it for a few sessions to become familiar with the movements. Then, when you are ready for your inward, healing journey, follow the second, Meditative Video. The second meditative video will enhance your lower back pain relief more than any other video you have done, if you do it mindfully and meditatively. If you are ready to purchase your healing, Body Window Lower Back Pain Videos, please purchase them below. May these lower back pain exercises start your journey to healing your body-mind-soul pain that has manifested in your lower back. Only $14.99 US Dollars for both videos! To see what it costs in your currency, click here. I am open to Expand and Release. I am well supported by God/the Universe. My back supports me in all things. I move through life with support and ease. I bend and flex with ease and comfort. I am like the willow in the wind. My back is free of knots and stress. I am flexible and mobile for all things in life. I am stable, strong and whole. I move with comfort through the tasks of life. I release all my worries. I believe that all things I need come to me. I am free to move and be who I am, just as I am. Your best option might be to download the videos (in .mp4 format) to your computer first, then save them to a cloud service, like iCloud, Dropbox, Google Drive, Mega, One Drive, etc. You will then be able to access the videos on your mobile iOS device from the cloud service. You will have to have the cloud service installed on your device, through their app. Then just download the document to the device from the cloud. If you do not have access to a computer, then my deepest apologies to you, you will not be able to download to your Apple mobile device. This situation is totally out of my control. Your downloading of the files should not be a problem at all! Lucky you! !